The Need-L-Lock crimping pliers' patented four-in-one tool combines a UR/UY/UG crimper, needle nose pliers, wire stripper and cutter. This means one less tool on your belt! These crimping pliers' aligned crimping jaws come down square ensuring a solid connection. 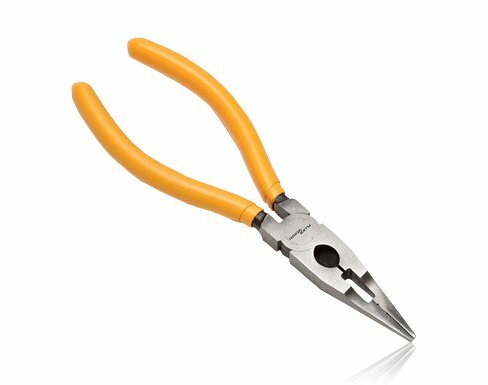 These pliers' crimping jaws are grooved to provide a better grip on wires and feature a built-in cutter and cable stripper. These 6.5" (16.5 cm) needle-nose crimping pliers are forged of high-quality steel with rubber-coated ergonomic handles for a reliable, non-slip grip.